On December 2014, Facebook began implementing new changes that affects many small business. But this change is for improving the overall quality of marketing, as you will note soon. Facebook removes three specific types of content: (1)Post content, which sole purpose is to make people install an app or buy a product, (2) Post content that makes people to enter contests or promotions without knowing any content, and (3) Posts that reuses ad content. A good example of an overly promotional content post without any description (of the app) is shown below. 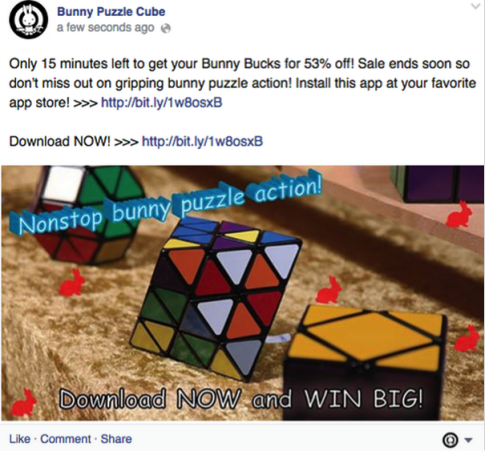 You can clearly see that we do not know what “Bunny Puzzle Cube” is, and what it does for the users. Such content fits into two of the three specific content mentioned above. Within Facebook, page content is more important than how many likes or follower it holds. To make sure your page is consistently being updated, you could use the Facebook Posting with content scheduling method. Facebook offers businesses a variety of targeting options in the Post Targeting and Privacy section under “Settings.” Posts targeted by gender, interests, age, or location. You can click “Promote post” to make this change rapidly. Facebook recommends short, descriptive phrases and high-quality lifestyle images. Businesses are advised to avoid sales messaging, such as “buy now” and “shop now.” These contents are more likely to be tagged as “spam” by users and multiple spam notice for a page will be notified to Facebook. According to Facebook, pages are an “easy-to-maintain online presence for people to discover and learn about a business,” that are mobile and tablet optimized, unlike many websites. Pages are also used as a customer service channel, and this won’t change anytime soon. Facebook is looking at in business perspective and asking the business owner to view the page as “a cornerstone of their online identity, not simply as a publishing service.” It is certainly true that Facebook requires consistent posting and it can be used for promoting your product, but it certainly could be used in different manners, such as responding to a recent customer sales review, or providing new product demonstration. According to Facebook, the survey results show that the users generally didn’t mind promotional content that’s identified as advertising. They just don’t like promotional organic content clogging up their News Feeds. Facebook ads can be highly utilized in building followers. Many small business can use Facebook and create a custom Facebook Ads. Businesses can pay Facebook to show custom ads to a specific audience, with costs varying based on the number of clicks and the reach of the ad. Facebook’s ability to target its customer audience with number of clicks, and relatively small amount of Ad spending on specific demographic and interest group is its biggest advantage among any other advertising platform. Facebook ads have previously been identified as one of the best ways to promote a product or service. Generally, Facebook ads are more likely to generate targeted leads than organic posts. If you are considering to improve your reach and increases sales for your products, you should consider setting up a Facebook Ad Manager.